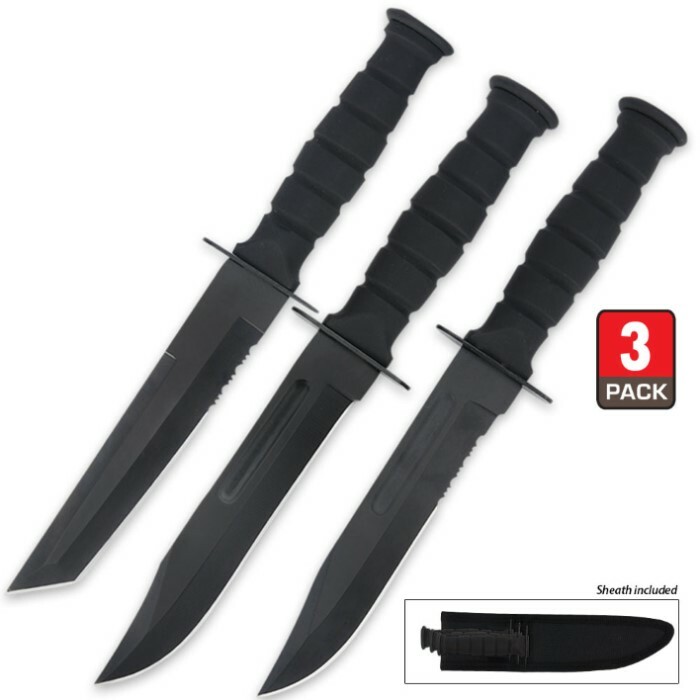 Triple Threat Fixed-Blade Knife Set | BUDK.com - Knives & Swords At The Lowest Prices! Get triple the work done with our Triple Threat Fixed-Blade Knife Set. Included in this set are three quality fixed-blade knives that will make fast work of practically any task you encounter. Each full-tang, tactical knife has a razor-sharp, black-coated stainless steel blade and rubberized, stacked-style handle for a slip-free grip. Two of the knives feature a blood groove; one is partially serrated; and the third features a tanto point. They all fit in a nylon snap-button sheath for convenient storage and carry. Why settle for one awesome knife when you get three in this set?